This is a really easy Polish dessert that takes advantage of seasonal plums. It’s typically Polish because it is not too sweet. In Babcia’s day, plums were only found in the fall but today they are grown around the world and available year round. 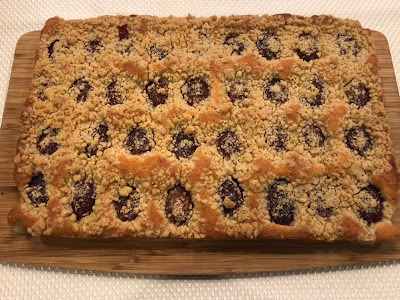 This cake uses Italian plums - sometimes also called Empress Plums. They are the European-style plum - small, dense, egg-shaped fruit with blue or purple skin and freestone pits. These are also the plums that are made into prunes. Italian plums are especially good for baking because they are a little more tart and the flesh is more firm, than the bigger, round deep red or yellow plums. Italian plums are a little harder to find but when you do, grab a bag full right away. Peter found these at our local Farmers Market just a few days ago and Laura made this crumble cake right away. Part of it is frozen so we can enjoy it a piece at a time, and the rest went to our neighbors who love it when Laura bakes. Preheat your oven to 350° F. Spray the bottom of a 10 x 15 inch pan with cooking oil. Cut a piece a piece of parchment to cover the bottom of the pan and extend over the edges by about an inch (so you can lift the cake out of the pan after it cools). Spray the parchment paper with the cooking oil. This should prevent the cake from sticking. Using a mixer combine the butter and sugar until pale and creamy. Mix the flour with the baking powder and add to the butter in small amounts, alternating with the milk. Add the egg yolks one at a time, beating constantly. Add the vanilla. In a separate bowl beat the egg whites until stiff. Fold into the dough and mix lightly. Spread the dough evenly in the prepared pan. Distribute the plums, cut side down, evenly on top of the batter, no more than half an inch apart. (Note: if your plums are not fully ripe or pretty tart, sprinkle them liberally with sugar and let sit for about 45 minutes. Drain well before placing on the batter). Mix the butter and flour until it resembles coarse crumbs. Add the sugar and mix well. Sprinkle the crumb mixture over the plums. Bake for 40 to 45 minutes (at 350° F) or until a toothpick inserted into the center comes out clean. If the crumb topping starts to brown too quickly, place a piece of aluminum foil over the top of the cake. Remove from oven and let cool. Cut into squares around the plums. Goes great with whipped cream or ice cream.